When I was in London a couple of weeks ago, I stayed in Shoreditch, one of the key tech centers in London, and the energy was palpable. Indeed, when we look at the latest statistics, London’s first quarter job growth was off the charts. 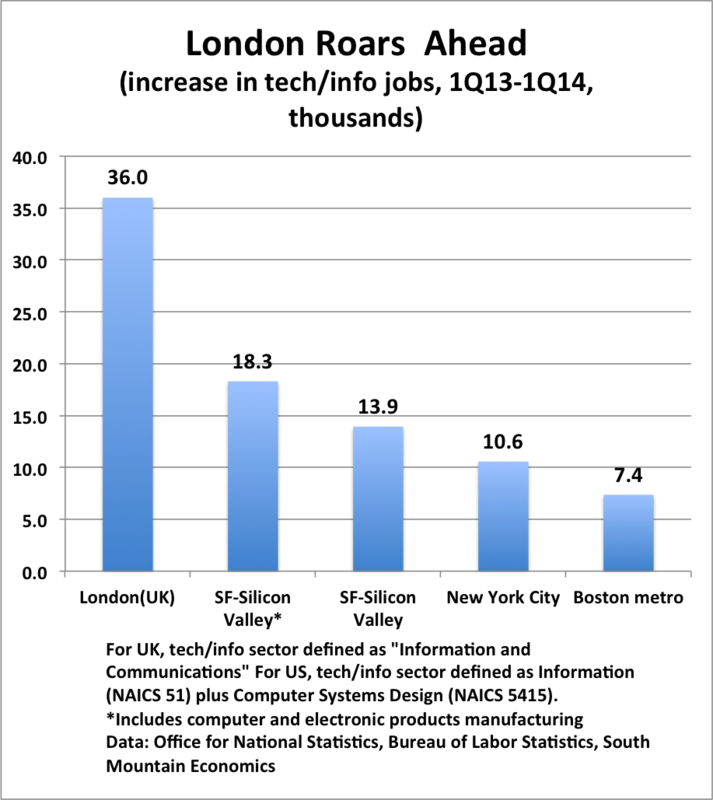 In particular, London’s tech/info sector grew by 9.6% from the first quarter of 2013 to the first quarter of 2014. The next closest U.S. state was Massachusetts, at a 6.2% increase in tech/info jobs over the past year (we have data for 23 states). Looking at the data in terms of the increase in the number of tech/info jobs, rather than growth rate, gives an equally impressive result. London added 36,000 tech/info jobs over the past year, roughly about equal to the combined gain in tech/info jobs in San Francisco-Silicon Valley, New York City, and the Boston metro area (respectively 18.3, 10.6, and 7.4 thousand). 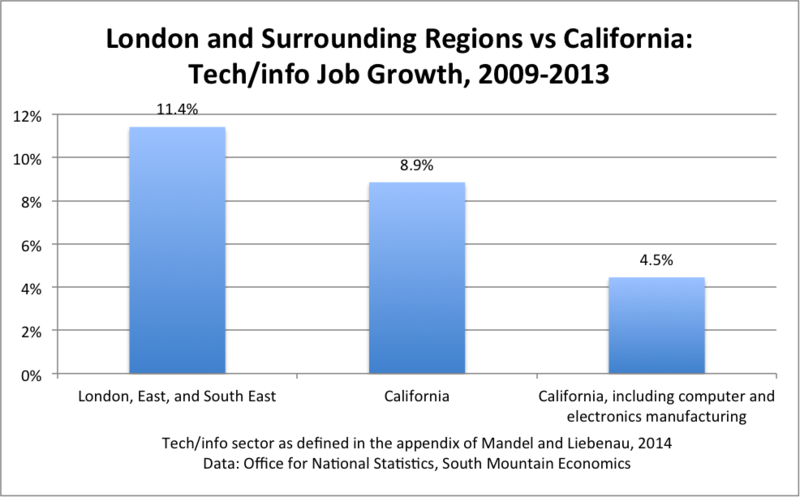 (Note:The SF-Silicon Valley number includes computer and electronic products manufacturing, a category covering companies such as Apple). Computer Systems Design (NAICS 5415). So the first quarter job statistics have come out for London, and the tech/info boom continues. London tech/info jobs are up 9.6% in the first quarter of 2014 compared to a year earlier. Coming after an 11.0% gain in the fourth quarter of 2013, we see a picture of a digital city on the rise.